With additional of PR Mat in between R4 and R5. ATK 99999 HP 6 CD 3 DEF100k Low chance of drop. 1) Clear the stage without revive using diamond. 2) Team consists of Members of 3 or more attributes. 3) Hidden: Team consists of Members of 3 or more races. There is no heart rune drop in the stage. 1 3423 1 122490 60 Ignore damage reduction and tumbler. 1 3892 1 109849 60 Ignore damage reduction and tumbler. 1 3674 1 118563 60 Ignore damage reduction and tumbler. 2 4632 2 363485 220 Attack twice in a turn. 2 4897 2 349832 210 Attack twice in a turn. 3b 12035 3 731589 830 Runes of the 3 randomly designated attribute must be dissolved to deal damage to enemy. 4 7893 2 846230 810 Runestones touched during rune movement will be masked. 4 6824 2 826873 750 The lower the enemy's HP, the higher its ATK. Attack twice when HP is below 30%. 5 6124 1 1589792 730 Enemy will freeze 3 runestones every turn. If frozen rune is not dissolved, it cannot be dissolved for the next 3 turns. 6 18682 3 1853150 910 Enemy is immune to damage when there is still minion. If there is no minion at CD0, enemy will not attack and revive minions instead. Rune movement time is reduced to 2 seconds. 8 8132 2 1534396 660 After death, enemy will revive with double ATK, HP and DEF. 9 12587 2 2073453 1080 Enemy is invisible until it first attacks. Enemy is immune to attack and control skill during invisibility. (Excluding active). If enemy attacks during invisibility, enemy will deduct 99% of summoner's HP instead. 10a 10823 1 3845693 1590 Enemy makes summoner unable to identify nature of rune. 3) Hidden: Both leader and ally are Gods. Skill I: 2 random Fire Members' CD reduced by 1. Skill II: For 1 turn, Fire ATK + 30%. Skill III: For 1 turn, damage received will not kill you. The stage is considered easy if compared to Odin NM. The main feature of this stage is no heart rune drop. Therefore, the standard way of doing it is either using a highly offensive team (possibly with heart converter) and burst through it or use Ursula/Barbara for life leeching. 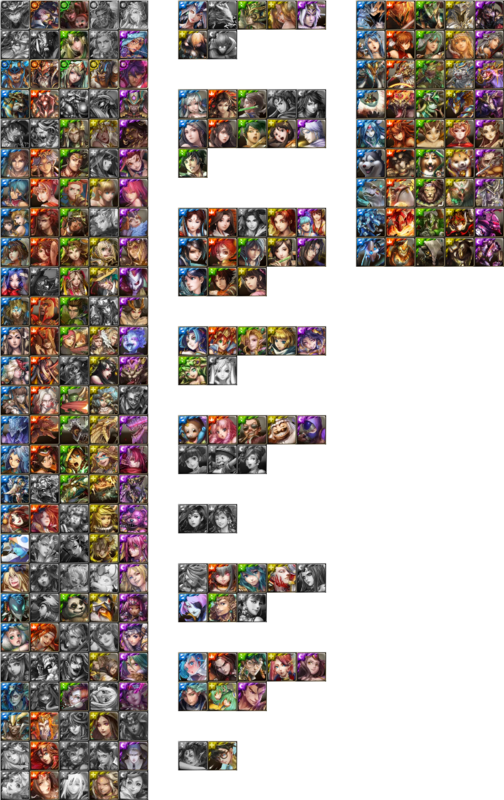 However, it is also possible to do this with Norn + PR Wukong grinding setup costing 0 dime to maybe 5 dime. R1-2, just leech and stall as much as you can. R3a and R3b, can manually heal back if you can break the shield consistently. R5 The Ursula should continues, waste it and grind on her. R6 Use Ursula again continuously. R7 Slowly grind until he hit you once, then use Ursula to burst it down. R8 grind on first form, after revive, burst using Ursula, make sure you are more than half HP before you burst with Ursula so that you enter R9 with full HP. R10b, Use Wawel + Chernabog + Ursula + DC for overkill. 3) Dual Babylon team, the 4 members are mostly burst card with or without heart converter. R1-8 pretty much just burst through everything with Babylon's high sustainable fire power. Most of the monsters are non-CD1, so bursting is not that difficult. R9 You either use a sniper to snipe it and kill it or tank it with full HP. The second method is recommended for dark Babylon so that you can maximize Odin's active for bursting. After she get out of invisibility, just burst her down. She is CD2 anyway. R10a and 10b, just ration your burst card to burst him down. For R10a, Babylon just need to spin columns normally and skydrop will do the damage for you. R10b is just the classic penta colour shield, should be easily doable with Babylon's rune movement time extension. With PR Wukong as ally, you are basically clear after you pass R1. The stage that you need to burst are: R4, R7, the rest are all grindable. a) Use PR Verdandi/Urd/Skuld as leader, their leader skill allows you to heal via other runes, so you don't die that often. b) Low CD sniper, it helps to minimize diamond usage by killing the elves faster. The info website is still updating in the meanwhile. I go for dinner first, then come back to continue. Btw, anyone want to make the DSI? Seems like Wawel - Ursula or Daji - Ursula is going to have a good time leeching. (05-01-2015, 07:30 PM)Arigato Wrote: Btw, anyone want to make the DSI? if You Found One Oh and Plz Tell me If Ursula/ Daji can Do this with 0 Dias & what are the members Cheers ! Mod, please move this thread to DSI section. Thanks. stage 9, a bit ambiguos so it will hit u for 12k and then 99% of maximum HP? I don't know yet. The info website did not make any clarification about it. For R10a, it is basically shuffle the look of each attribute. For example, Fire may look like Light and Light look like Water, etc. You can hold on the rune, from the arrow indication, you can know which attribute is Water and Earth. The look is fixed though. The only teams I can think that can beat this is dragons or ML. The back to back bursts required are too high.